Orion, the Hunter, can look more like a box with a bow across the middle (Orion's belt) to holiday-minded observers. Here, it can be seen at 8 p.m. EST Dec. 25 from New York. December is the month of the winter solstice, which a large part of mankind associates with such celebrations as Nativity festivals. The moment of the solstice occurred on Dec. 21 at 11:28 a.m. EST (0428 GMT): The sun, appearing to travel along the ecliptic, reached that point in the sky where it is farthest south of the celestial equator. While a variety of customs have been linked with this special season for thousands of years, the exchanging of gifts is prevalent among many different cultures. Mother Nature herself offers two gifts to sky observers in northern, temperate latitudes: the longest nights and a sky more transparent than usual. One reason for the clarity of a winter's night is that cold air cannot hold as much moisture as warm air can. Hence, on many nights in the summer, the warm, moisture-laden atmosphere causes the sky to appear hazier. By day it is a milky, washed-out blue, which in winter becomes a richer, deeper and darker shade of blue. For us in northern climes, this only adds more luster to that part of the sky containing the beautiful wintertime constellations, as this week's sky chart shows. Indeed, the sky this time of year can be seen as nature's holiday decoration to commemorate the winter solstice and enlighten the long, cold nights of winter. During these frosty evenings, one of the most famous asterisms is in the northwest. Originally known simply as the "Bird" in ancient times, without any indication of what sort of bird it was supposed to represent, it later became the constellation Cygnus, the Swan. 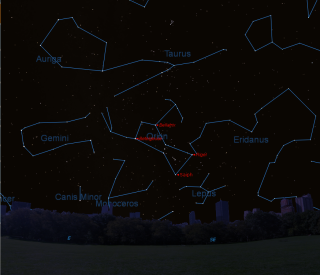 But the brightest six stars of Cygnus make up an asterism that's more popularly called the Northern Cross. Bright Deneb decorates the top of the Cross. Albireo, at the foot of the Cross, is really a pair of stars of beautifully contrasting colors: a third-magnitude orange star and its fifth-magnitude blue companion are clearly visible in even a low-power telescope. While it is usually regarded as a summertime pattern, the Cross is best-oriented for viewing now: It appears to stand majestically upright on the northwest horizon at around 8:30 p.m. local time, forming an apt Christmas symbol. Furthermore, just before dawn on Easter morning, that cross lies on its side in the eastern sky. High toward the south, at around 10:30 p.m. in your local time zone, we see what astronomy author Hans A. Rey (1898 to 1977) called a Great Hexagon of bright winter stars. To the south and a little east lies Sirius; up to the west, Rigel. Still higher, reddish Aldebaran; then at the north end of the circle, Capella. South and slightly east, we come to Castor and Pollux, the heads of the Gemini twins. Finally, south again to Procyon: in all, seven bright stars in six constellations. In the center of the hexagon, more or less, you have the ruddy star Betelgeuse. This is the rich region that gives the winter sky its splendor. If you plan to be outside for a long period of time on these frosty, cold nights, remember that enjoying the starry winter sky requires protection against the prevailing low temperatures. One of the best garments to wear is a hooded ski parka, which is lightweight yet provides excellent insulation, along with ski pants, which are better than ordinary trousers. And it is also important to remember your feet. While two pairs of warm socks in loose-fitting shoes are often adequate, for protracted observing on bitter-cold nights, wear insulated boots. For those who receive a pair of binoculars or a telescope for a holiday gift, Christmas week will offer the best views for observing the moon, one of the most fascinating celestial bodies. In fact, we can see a wealth of detail on its surface even with just a little optical power. Around those times when the moon is half-lit or gibbous phase, those features lying close to the terminator — that variable line between the illuminated portion and the part of the moon in shadow — stand out in sharp, clear relief. In contrast, around the time of full phase, the moon appears flat and one-dimensional as well as dazzling to the eye. The moon will arrive at first-quarter phase on the day after Christmas, Dec. 26 (Boxing Day for our friends in Canada and the United Kingdom) at 4:20 a.m. EST (0920 GMT), when its disk will be exactly 50 percent illuminated. How does its brightness compare at that moment with full? One would think it's half as bright, but in reality, astronomers tell us that a first-quarter moon is only 1/11th as bright as a full moon. And believe or not, it isn't until just 2.4 days before full that the moon actually becomes half as bright as full!